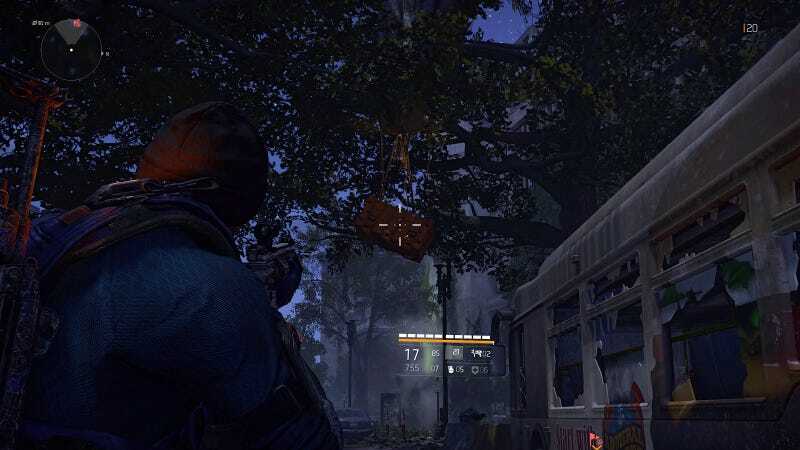 I was maybe 20 hours into The Division 2 when I first realized there was loot in the game’s trees. Maybe it was 30 hours. In The Division 2, however, I’m finding parachutes and loot crates in trees all over the place. I’m now noticing them in other strange places, too, like the roof of a museum. Fun fact: I thought I was going to be able to say that the dangling crates always operate with a certain logic and always drop cosmetic dyes for your clothes or weapons. That had been my experience until I shot at the one hanging from that museum (it’s the National Museum of African American History and Culture, by the way, and likely the newest museum in the game). The crate hanging from the museum didn’t drop a dye but had other decent loot. Oh well. Maybe it’s just the ones in trees? Fun fact 2: Yes, this is the third Division 2 game diary of the week. Variety is the spice of life, folks, but when half the team is on the road and your editor-in-chief is playing just one game every day to inch closer to review, well... We’ll have some non-Division diaries next week!